Searching for a waterfront home is a dream come true for many people. Being able to fish, boat, swim, and sunbathe on your own property are attractive draws. Don’t get so caught up in the excitement that you miss important things to consider when buying a waterfront home. Typically, a waterfront home will cost more than a standard home. For this reason, you’ll want to get your home mortgage pre-approval completed early in the home buying process. Having a pre-approval letter will let you know your target price range and keep you from wasting time searching for homes outside of that range. Find a real estate agent that specializes in waterfront properties. There are different things to consider when buying a waterfront home that you wouldn’t have need for if you were buying a home elsewhere. Your real estate agent should be an expert when handling the differences. It’s important that your real estate agent know about the area and water access restrictions. When you’re considering your budget, take in to account that you’ll need to obtain homeowner’s insurance that could be more complicated than a standard policy. Due to the proximity to the water, you may be required to have special insurance provisions for flood or water damage. Your real estate agent will know more about the regulations in the area. The elements can cause damage on any home, but there are special considerations when you live near the water. When looking at waterfront homes for sale, check external features thoroughly to ensure that everything is in good order. Ask questions about how well the house weathers storms and if there’s been any previous flooding. While you know what you are looking for in a home, you’ll need to know what you expect from the property. Your wish list may include an updated kitchen, hardwood floors, and an open concept living space for the house. If you’re looking at waterfront homes, you’re most likely dreaming of all the activities you’ll get to enjoy. This is where you’ll need to put some focus on the actual property and your expectations. If you plan to have a boat, you’ll want to make sure you can dock your boat. You may need to meet certain boat size requirements for the area. If boating is in your plans, you would be disappointed if your boat wasn’t able to navigate the waters around your home. If you picture yourself walking barefoot in the early morning hours along the shores of the water, you may be disappointed if the area is rocky and unsuitable for such things. Consider the depth of the water and any issues you may have with swimming in the waters near your home. Know the laws when it comes to using the waters in your area. This is where the information your real estate agent can provide is valuable. They will know if swimming is allowed in the area, or if certain types of boats are restricted. You wouldn’t want to find the perfect waterfront home, only to discover that it doesn’t fit your recreational needs. If you’re planning to build your own home on land near the water, check on requirements for land-clearing and building permits. You’ll need to make sure the land is suitable for building. Know whether you will have any trouble setting up utilities in the area on a new construction. Many waterfront homes are part of an association of homeowners. If so, they will have their own set of expectations and bylaw. They may require a monthly fee. Do your research, and make sure you understand their bylaws and are willing to work within the boundaries of their expectations. Once you find a waterfront home that meets your needs, you’ll want to meet the neighbors. While you won’t know exactly how it is to live there until you’ve moved in, you will get a chance to see if you mesh well with those who live in the area. Listen to what they have to say about the local weather and community events. You may be surprised to find that neighbors know interesting facts about the house that are not general knowledge. 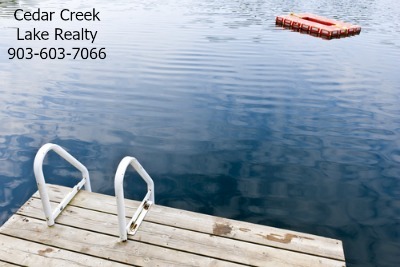 Call Cedar Creek Lake Realty Team, your lakefront living specialists, today at 903-603-7066 to tour available waterfront homes in the area.